Tattie Sculls were baskets used for collecting potatoes (tatties) on lowland farms. These were often spale baskets made from split wood, but could also be baskets made with a frame of oak or hazel and woven with willow or cane. 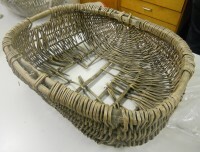 In more recent times tattie sculls made from natural materials were replaced by wire baskets of similar shape and size.